In May 1972 in a uranium enrichment plant in France, scientists examining ore from a mine in Gabon, West Africa, discovered that a natural nuclear reactor had spontaneously manifested in that region in the Earth's primordial past, churning out approximately 100 Kw worth of energy continuously for a few hundred thousand years about 1.7 billion years ago. In order to understand how the natural nuclear reactor came about, it helps to understand a little of the history and science of nuclear reactions. According to the International Atomic Energy Commission (IAEA), there are over 400 nuclear power plants operating in over 30 countries; and despite recent catastrophic safety failures like the tragedy at theFukushima Daiichi in 2011, nearly 70 new nuclear power plants are currently under construction. So why do we keep building such potentially dangerous facilities? Power that, despite such disasters as Chernobyland Fukushima, megawatt for megawatt is actually, overall, generally considered safer and "greener" than power generated via coal or gas. This type of nuclear power is created when an isotope, frequently uranium 235 (U-235), is bombarded with a neutron. 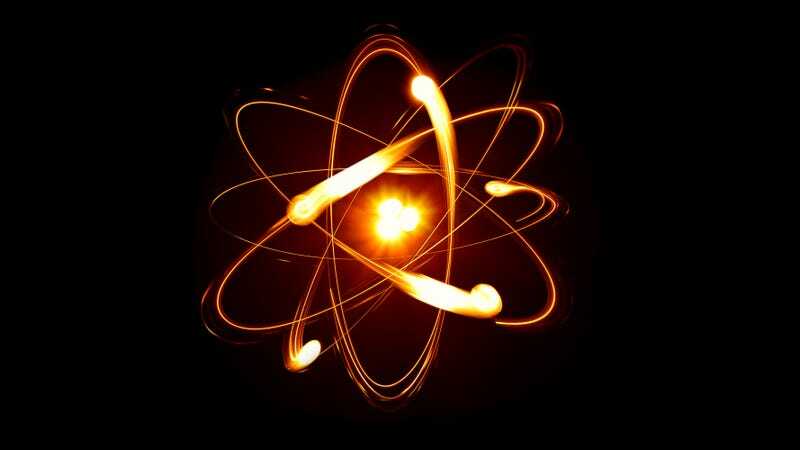 The collision typically breaks the isotope into two pieces, each containing half of the neutrons and protons of the original atom, in a process called nuclear fission. During the reaction, a small amount of mass is lost, which is the result of a tiny bit of matter being converted into a relatively large amount of energy. In a typical reactor, a whole lot of U-235 is assembled and then bombarded with neutrons; in each collision between U-235 and the neutron, two more neutrons are produced along with the release of energy. As long as there are enough U-235 isotopes about, those extra neutrons will cause additional reactions. The reactions grow exponentially in a process called a chain reaction that produces even more energy. Nuclear power plants harness the energy from these controlled chain reactions and convert it to electricity that powers things like this MacBook Air on which I'm writing. Uranium is one of the heaviest elements, with an atomic weight of 238.03. Pertinent to this article, only three isotopes of it are found naturally in the Earth's crust; U-238, which makes up 99.3% of all uranium, U-235, which comprises most of the remaining .7%, and U-234, which is present in only an infinitesimal amount. U-238 is only mildly reactive and does not make good fissionable material. U-235, however, is outstanding at being split and producing lots of energy. When it comes out of the ground, uranium ore is comprised of the three isotopes in their relative proportions. In order to be fissionable, the percentage of U-235 in the ore must be increased from .7% to about 5% of the whole. This process is known as uranium enrichment. In the typical enrichment scenario, the uranium is converted into a gas, uranium hexafluoride (UF-6), and the gas is separated by weight (remember, U-234 and U-235 are lighter than U-238). The separation allows enough of the heavier uranium to be removed, and the remaining substance ultimately has a suitable concentration of U-235 for fission. You may ask: "If uranium ore is unsuitable for nuclear reactions without a complicated, manmade enrichment process, how did a natural one get started nearly two billion years ago?" Good question, and the answer is not "aliens." U-235 has a significantly shorter half-life than U-238, so in the far distant past, it should have been far more abundant, and in greater concentrations than it is today. Scientist Paul K. Kuroda proposed in1956 that this U-235-rich ore, under the right conditions, would have supported nuclear fission, and chain reactions, that would form natural nuclear reactors. There are two theories about how the Gabon reactor worked, although both assume a cycle of chain reaction, cessation, cooling, repeat, over a period of thousands of years, until the fissionable material was exhausted. One theory proposes that the uranium was covered with groundwater, which moderated the neutrons and provided an environment that supported a chain reaction. The energy generated eventually heated the groundwater to boiling, and it steamed away. With the groundwater gone, the reaction stopped. Eventually, water seeped back into the uranium cavern, and the process repeated, until the concentrations were too low to support further reactions. The second theory, which is not well accepted, proposed that the burning reactor released certain rare earth elements, like samarium, gadolinium and dysprosium, which absorbed the neutrons and stopped the chain reaction, for a time, or in certain places, only to have it pop up again nearby. This similarity (to a geyser) suggests that a half an hour after the onset of the chain reaction, unbounded water was converted to steam, decreasing the thermal neutron flux and making the reactor sub-critical. It took at least two-and-a-half hours for the reactor to cool down until fission Xe (xenon) began to retain. Then the water returned to the reactor zone, providing neutron moderation and once again establishing a self-sustaining chain. So how do we know this ever happened at all? Several reasons. First, in the initial, French investigation in 1972, it was found that the concentration of U-235 from the site was much lower than it is typically observed in nature; in fact, the concentrations from the Oklo samples were similar to those found in spent nuclear fuel. Second, the French also discovered discrepancies in other isotopes from the site, including neodymium and ruthenium, both of which are consistent with U-235 fission. Third, in a 2004 study Washington University physicists investigating the site discovered elevated amounts of zirconium, cerium and strontium that were produced via nuclear fission. Fourth, the American scholars also identified that the Oklo deposits contained the largest concentrations of fission-produced xenon and krypton ever found. It is fascinating to think that a natural nuclear reaction can reach the critical conditions, and that it is also capable of storing its own waste. On a final note, it is reassuring to know that naturally occurring U-235 does not exist today in the concentrations necessary to start or sustain a modern day natural nuclear reactor. So, although someday we may have to live through another Chernobyl, at least we'll know we only have ourselves to blame. Three Mile Island, the nuclear power plant accident near Middletown, Pennsylvania, is the most serious power plant accident in U.S. History. It led to no deaths and no injuries to plant workers or the nearby community. It was still rated a level 5 on the INES, even though it really should have just been rated a level 2. If you camped out at the plant at Three Mile Island during the accident that happened there in 1979, you'd have received only an additional 80 millirems of exposure during the duration of the accident. For reference, if you've ever had your spine x-rayed, you'd have received about double that just during the few seconds of the x-ray. If you were around ten miles away from the reactor during the accident, you'd have received about 8 millirems or about the equivalent ionizing radiation of eating 800 bananas, which are naturally radioactive. There are no known deaths/cancers/etc. that resulted from the Three Mile Island accident. Public reaction to Three Mile Island went extremely overboard from what the actual event warranted. This was largely due to misinformation in the press; misunderstanding of ionizing radiation among the general public; and the fact that, not 12 days before it happened, the movie The China Syndrome was released. The plot of the movie was how unsafe nuclear reactors were and just about everyone in the movie but one of the main characters was trying to cover it up. The China Syndrome movie title's concept comes from the premise that if an American nuclear reactor core were to melt down, it would melt through the center of the Earth to China. Getting around the fact that it is actually the Indian Ocean that is on the opposite side of the Earth from the U.S., not China, and the obvious problems with the "melt through the Earth" premise, it couldn't have been a better timed movie as far as free advertisement through the press due to the Three Mile Island incident. The movie was nominated for several academy awards, including best actress by Jane Fonda. Melissa writes for the wildly popular interesting fact website TodayIFoundOut.com. To subscribe to Today I Found Out's "Daily Knowledge" newsletter,click here or like them on Facebook here. You can also check 'em out on YouTube. This post has been republished with permission from TodayIFoundOut.com.